I would have sworn I’d posted this one already, but I don’t see it in the past news, so here goes. 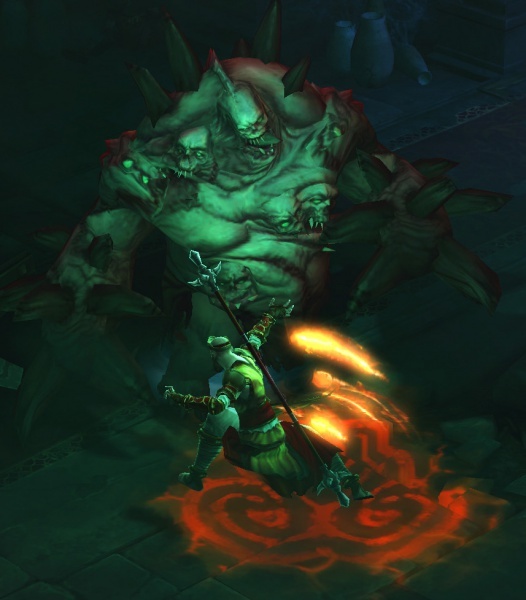 Diablo III’s Lead Technical Artist Julian Love was interviewed by AusGamers at the Blizzard media event last week, and said stuff. Stuff! AusGamers: In terms of the iterative process in nailing how all of the classes felt and the characters looked. I guess how long was that? Obviously the game has been in development for a while and who’s changed the most? Julian Love: Wow, so “Who’s changed the most?” I think the Witch Doctor probably has changed the most from end to end — we really didn’t know what we were shooting for. In terms of the Barbarian, I think that’s just gotten bigger and bigger and bigger as we’ve gone, but it hasn’t taken many twists and turns. The Witch Doctor, I think out of the gate there was some things that we knew we really wanted, but there were other things that were kind of elusive. I’m not sure where they came from, but maybe we just didn’t have a read on “what does the voodoo vibe mean and how crazy can we get with that?”. So the earlier versions did have that strong voodoo vibe, but it just never really quite took off until we did a pass. That’s kind of what we do, we look at the character when we’ve gotten a certain amount of stuff in and we back up and say “well, is it really hitting it; is it really as fun?” and we do a pass on it where we focus on it for a month or two and on about the third pass, all of this crazy stuff started to open up with the witchdoctor where we got the toads and the zombie-bears and then the fire-bats and then shooting a snake out of a blow-gun. It’s just exploded, and that’s where that character finally hit. Given the panels at Blizzcon ’10 I would of thought the Demon Hunter was the most changed. To be perfectly honest… in D2 the necro was my least played class. I wanted to blame having pets, but then i made poison/bone or whatever necro with just a golem i think and it still wasn’t terribly fun to me. That being said, I dont’ really like the WD class. partly due to the fact that i guess i just don’t like the pet class too much, partly because i feel like some of the skills are … not fitted to the WD.. culture. For instance, the word VOODOO is great. i actually looked up witch doctor on wiki because i was arguing with my friend about the skills, and basically it came out to be mostly about healing, healing curses and hexes caused by witchcraft. So i saw the beta gameplay and saw that he had a sort of vertical zombie wall skill where 3 or 4 zombies piled on top of eachother and then did a timberrrr and fell onto enemies.. then in the old “HD boss fight” videos he had a zombie wall. which, don’t get me wrong, is pretty cool, but i just don’t feel it fits into the WD class. my friend made a point about the pirates of the caribbean, calypso was kind of a shaman WD character and she brought barbosa back to life. i argued that most zombie movies nowadays are more about the “re-animated dead” versus “being brought back to life”, as in the zombies are just lifeless husks versus cool i escaped death. so i get the toads, big spider, big curses, i just feel like the zombies are out of place. anyway i might be the only one that thinks this way but i just felt like sharing. i’m sure RMAH + skill point removal and freespec will take up more debate time. i’m just postponing bedtime because i ate a whole mess of wahtaburger and i feel sick. You are looking at it from a real world perspective- read his lore. It fits. I will read the lore. but that brings me to my next question.. how come there’s no WD video? anyway like i sad, such a minor issue that good night. What doesnt fit in in the Diablo lore, is the more humerous crazy stuff that makes no sense – such as the barbarian throwing corpses! Zombie bears and giant toad are in that direction also, although not as “off”. Do you see why Necro (or WD?) corpse explosion makes sense, while barbarian throwing corpses does not? How coudl barbarian make corspes a cangerous weapon? Also the graphics for it looks really bad. If he was throwing a ragdoll LIVING enemy that collides and disturbs other enemies – THAT I can buy. yeah throwing corpses is a bit strange. i think the same thing about zombies that come out of the ground only to climb on top of eachother and then fall down, lol i imagine them doing it with the wrestling style body slam with the elbow down. the one that’s strangest to me is yup zombie bears.. it’s a strange skill, they look like a pod of dolphins jumping at the surface. and bears dont’ really fit into the whole tribal shaman theme. ok well i just looked up “shamans with bears” on google and there’s quite a bit of bear presence in shaman … culture. it just looks weird ok. The WD and Barb debuted in June 2008 and didn’t get char cinematics. Probably a mistake by bliz not to do one for the WD retroactively. We don’t need one for the barb; his story and archetype is well known and basically self-explanatory. But the WD is perpetually the least liked char, and a lot of that is b/c they haven’t exposed people to the lore or char story much. He’s a weird underdog class (visually), so maybe it’s best all the comedy relief skills get tossed in his direction. I am guessing I am one of the few that will be playing the WD at release. I loved my summonmancer and it was definitely my highest level HC character by a long shot and this was post 1.10 so it was a difficult process. And since HC seems to be exempt from most of the things that upset me about D3 I definitely see me spending a lot of time there.